OFFBEAT MAIL: Is China serious to mend ties with America? Is China serious to mend ties with America? U.S. President Obama and President Xi. was a matter of diplomatic mission, perhaps, to further strengthen the ties that bind between the two countries. But to other political experts, Xi's visit to the White House was properly choreographed to let the world know that China is a friendly nation that is always ready to shake hands with other leaders even in the midst of a controversy that involves national security. As reported by Bloomberg Businessweek (Sept. 21-27 issue), the Chinese leader's visit had two goals: "to reassure executives that China is still a good place to do business, and to secure for China the respect due a state of equal in stature to the United States." Maybe true, maybe not. That is probably what other pundits are talking about, knowing how China's aggressive stance on the issue of human rights violations, cybersecurity and the tensions that its military has created in the South China Sea. Aware of these issues, the U.S. government has, in fact, urged China to "speed up its financial reforms so as to avoid another repeat of the summer's stock market crash or the poorly managed devaluation of the yuan--events that shook the world markets." Orville Schell, director of the U.S.-China Relations in New York, told Bloomberg: "The relationship is not great and has been getting worse." While Zhu Feng, professor of international relations at Nanjing University, readily agreed. He added in the Bloomberg report: "A lot of things have piled up, and the stakes have never been higher to deal with these accumulated concerns." Despite the diplomatic respects that the U.S. government has shown during Chinese leader's visit, the "administration appears far from treating China as an equal." Some political observers believed that the U.S. is still superior than China. And I wouldn't be surprised at all why China has acted the way it should? Of course, it is public knowledge that China holds trillions of U.S. commercial debts. However, it doesn't mean that the U.S. will kneel down to the pressures that China would want to impose without first mending its slightly severed ties with the United States. One the serious issues that China should address impinges on the "cyber espionage emanating from China after it breached the U.S. Office of Personnel Management where it exposed the records of some 20 million current, former and prospective federal employees." Suspects in the said breach were believed to be Chinese hackers who stole commercial information. In fact, President Obama said on Sept. 11 at Fort Meade in Maryland that "cyber attacks are not acceptable." Although Obama didn’t specifically mentioned that it was done by the Chinese hackers upon the dictate of Chinese officials. If this concern rings true, how on earth could China do such a breach while at the same time, coming to the U.S. to woe more prospective businesses to relocate in China? The situation has a semblance to a story of a "wolf coming in a sheep's clothing." To some observers, China's actions may be misconstrued as a wagging of its tail for having accumulated so much debt papers that the U.S. may not be able to redeem in the future. Perhaps, this is a secret weapon that China is trying to display, if only to show the world that it has an economic edge over the U.S. now? For a moment, the world has yet to wait on the sideline whether the soured relationship between the two countries could be mended in due course. 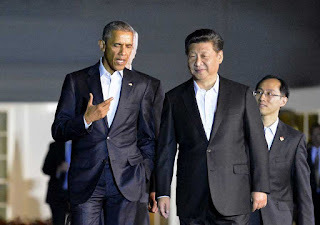 But with the outcome of President Obama’s recent official visit to China, where international political observers were surprised to learn of China’s failure to give the U.S. leader a “red carpet” welcome at the airport? Sources said it was a move by Washington to not roll out the red carpet on account that the Chinese driver of the ramp at the tarmac couldn't speak and understand English. Was this China’s deliberate attempt to let the world know that it isn’t happy about the United States’ interference in the South China Sea disputes with some claimants, especially the Philippines which won a favorable ruling in July 2016 from the Permanent Court of Arbitration concerning its valid claims over some of the islands and reefs in the South China Sea based on the provisions enshrined in the charter of the United Nations on the Law of the Sea, which China is a signatory. Yet, it continues to violate what it signed for by merely invoking the historical significance of its ancient claims on almost all parts of the South China Sea. Ignoring the ruling of the arbitral tribunal, China continues its elaborate display of military might by reclaiming some of the islands and reefs inside Philippine territorial waters. Latest of which is China’s attempt to build infrastructures at the Scarborough Shoal, which is only about 120 nautical miles from Zambales province in Luzon.